Dianne Ochiltree is the author of several award-winning picture books for the very young, including Ten Monkey Jamboree, Sixteen Runaway Pumpkins (Margaret K. McElderry Books) and Lull-a-bye, Little One (G.P. Putnam's Sons). Dianne lives in Sarasota, Florida, with her family and pets in a house by the bay. You can visit her at ochiltreebooks.com. 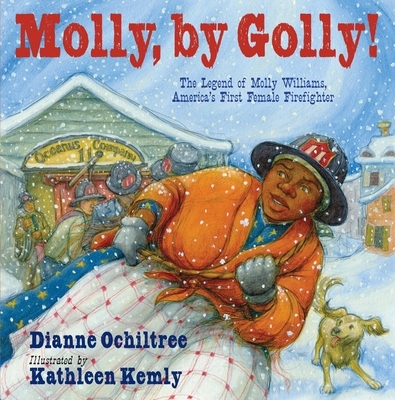 Kathleen Kemly's research for Molly, By Golly included a trip to the New York City Fire Museum. While in New York she was able to imagine Molly's life there and what the city was like many years ago. Kathleen illustrated You Can't Do That, Amelia! for Calkins Creek and A Fishing Surprise for Cooper Square Publishing, among others. Kathleen lives in Seattle and can be reached at kathleenkemly.com.